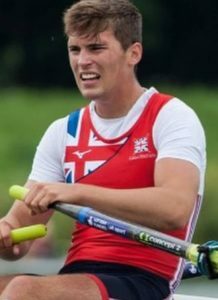 We became aware of Jake when his PE teacher approached us about this aspiring 16 year old British rower. Despite only commencing rowing in December 2014, Jake had won Gold at both the London Youth games and National Schools events. Already on the GB pathway, he has a burning desire to be an Olympian and we are delighted to play a small part in his journey. If you are looking for a story of an inspiring teenager then look no further than Jake Offiler. This young man has drive and determination in abundance and we caught up with him to find out what was happening in his life. We discovered that not just content with rowing competitions, breaking records and upcoming GB trials, Jake is also revising hard for his upcoming A level exams. Still not enough? Ok, his bands first mini album is about to be released!! Jake had won Gold in the quadruple sculls at Burway Head and followed that up with a further Gold at the Kingston Head of the River, again in the quad. Further success has come at the National Junior Indoor Rowing Championships where not satisfied with the title, Jake also recorded the fastest time of the whole competition including the year above. The only disappointing row for Jake recently came at the National Schools “Head on the Tideway” where his quad came 8th. “Whilst this was disappointing, it was not a true reflection of our standard” said Jake “as it was by far the worst conditions I had ever rowed in”. Jake has also completed a VO2 max test which he described as very painful but a great experience. Thanks to some further sponsorship coming from Sports Aid through British Rowing, Jake is just about to purchase an indoor rowing machine. This will allow at this critical time, for Jake to spend more time on school work, that he would otherwise have spent travelling to the Rowing Club for training sessions. Trying to balance cramming for exams without losing fitness is clearly a challenge and one that I imagine very few people actually appreciate. But it appears that young Jake is pretty good at this juggling act as he casually drops in, that his band is releasing their first small album on the 12th of this month. The band is called ‘The Switches’ and the EP is entitled Tuesday’s Chicken. We will be following this young man with interest.